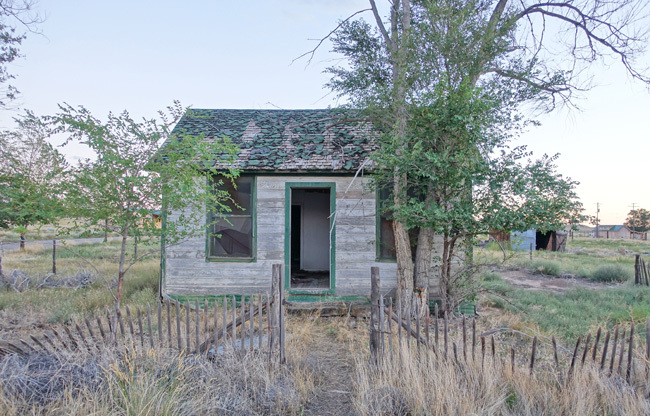 Thompson Springs, Utah, once an important railroad hub, has been slowly dying over the past several decades. 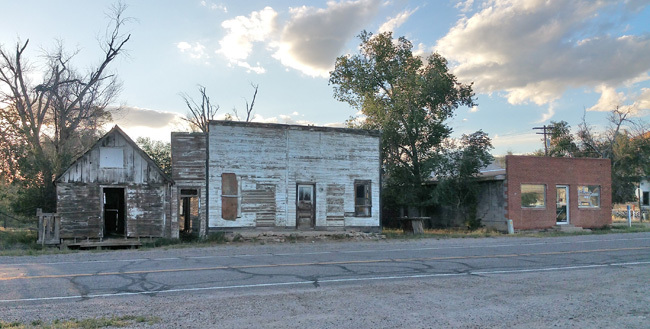 Abandoned homes and businesses languish along its main street, grim reminders that the beautiful little community may soon meet the same fate as its neighbor, Sego ghost town. 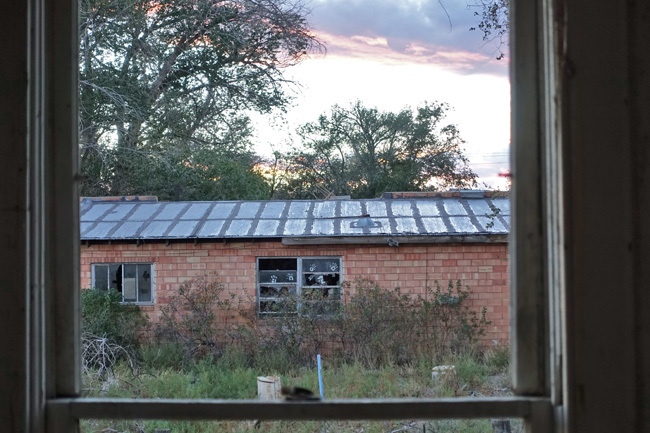 After spending the afternoon at the awesome abandoned Athena missile base in Green River, I devoted the remaining daylight hours to exploring the abandoned places in Thompson Springs, Utah and Sego, a ghost town just north of there. 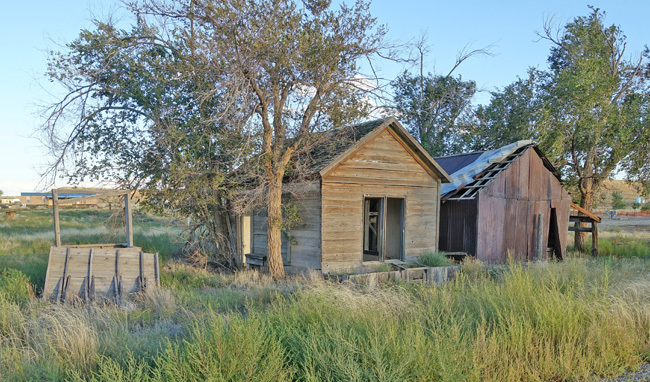 Thompson Springs has a population of under 40 people, so it isn't a true ghost town, though it could easily be mistaken for one. 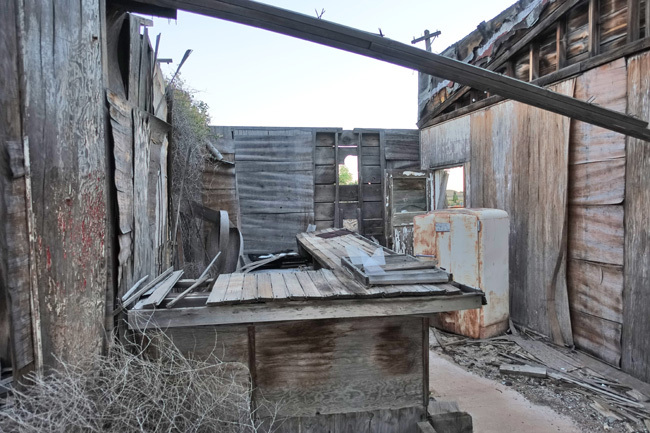 Nearly all of the houses and shops along Frontage Road (formerly Old Cisco Highway) are abandoned and in an advanced state of decay. 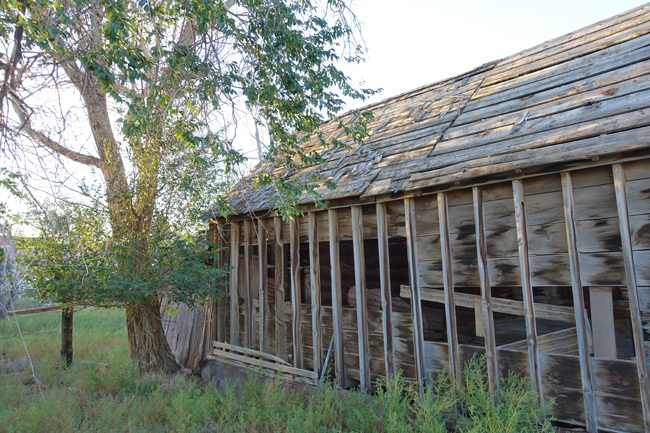 Thompson Springs was founded in the late 1800s and named after E.W. Thompson, a sawmill operator who lived and worked near the Book Cliffs to the north. 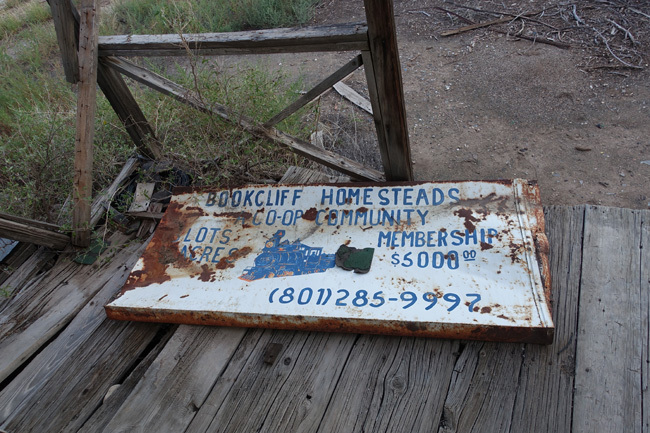 In 1883, the Denver and Rio Grande Western Railroad established a stop in Thompson Springs, which allowed farmers and ranchers in the Book Cliffs area to ship their livestock. I fell in love with Thompson Springs from the moment I first laid eyes on it. 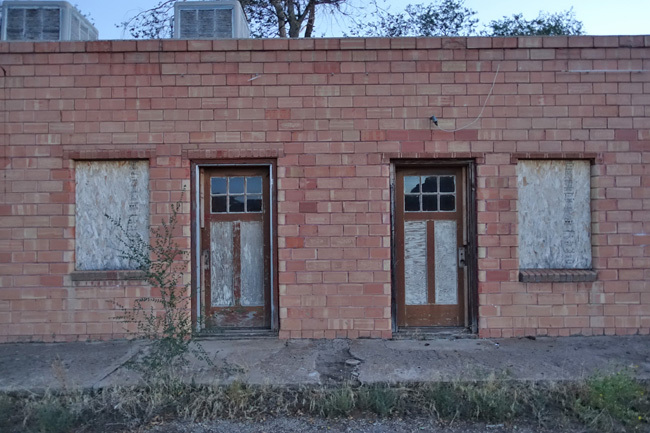 There are an incredible number of beautiful old abandoned buildings right in the middle of town. 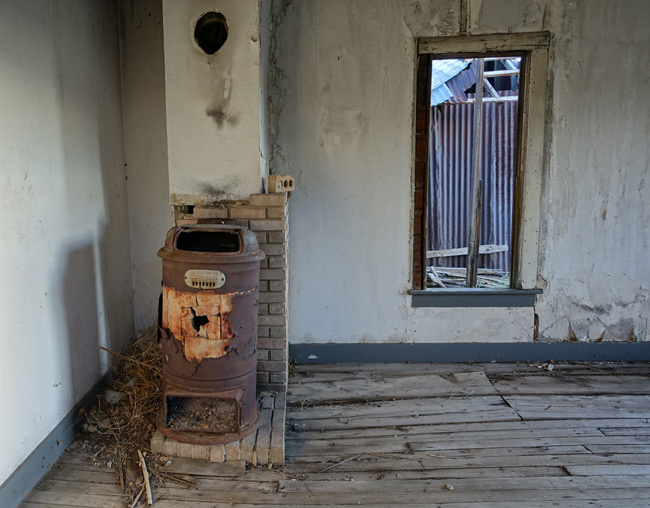 Some contain interesting artifacts, like this old heater. And a sign for an old bar/cafe. 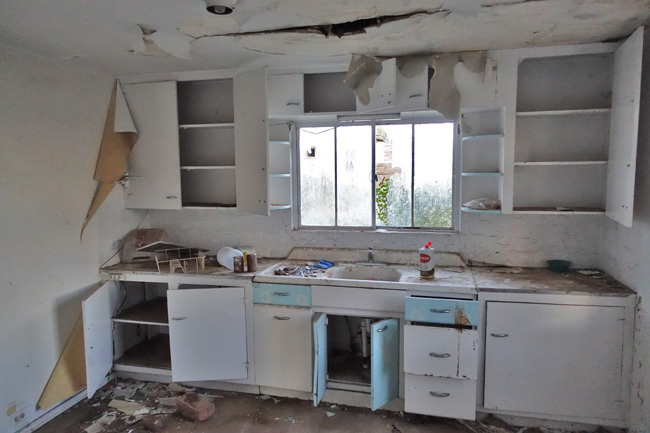 The abandoned homes didn't look too bad from the outside. 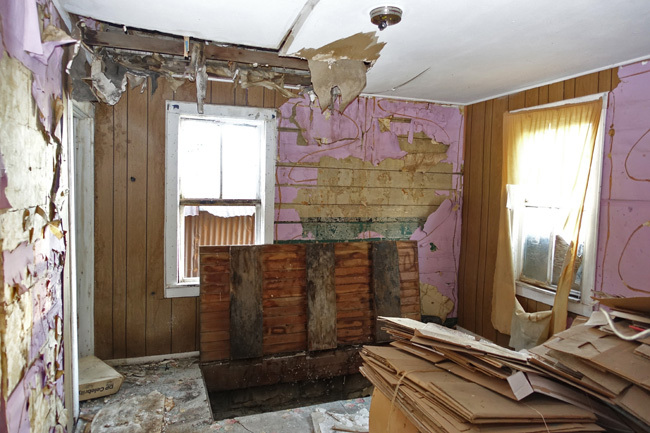 But the interiors were in awful shape. Trash and discarded clothing littered the floors. 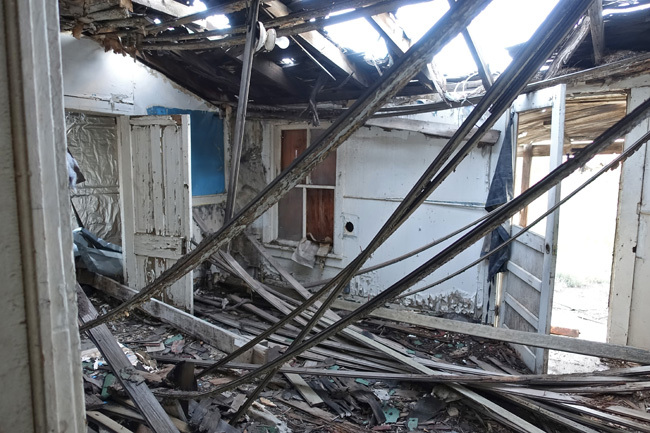 Many of the ceilings had collapsed, leaving enormous holes in the roofs. 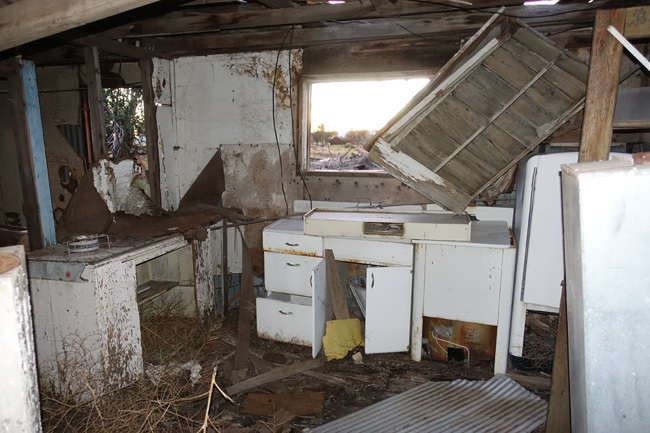 A few homes still had old refrigerators and cabinetry inside. 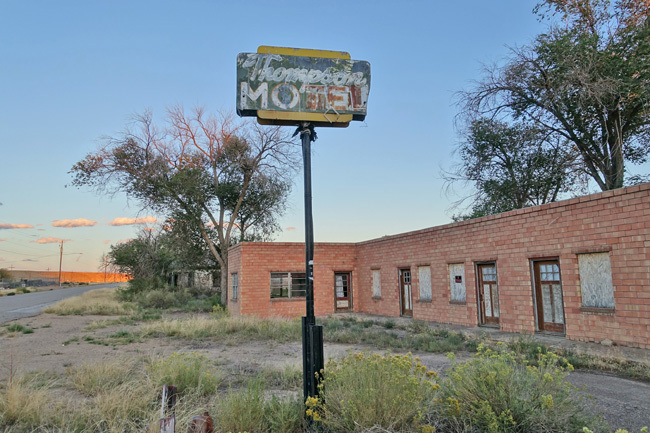 The old Thompson Motel, one of the most striking remnants of the town's heyday, looked like it had been abandoned quite some time ago. Faded plywood covered the windows of the guest rooms and the doors were secured shut. I peeked through one of the smashed panes and saw that little remained inside except dirt and trash. 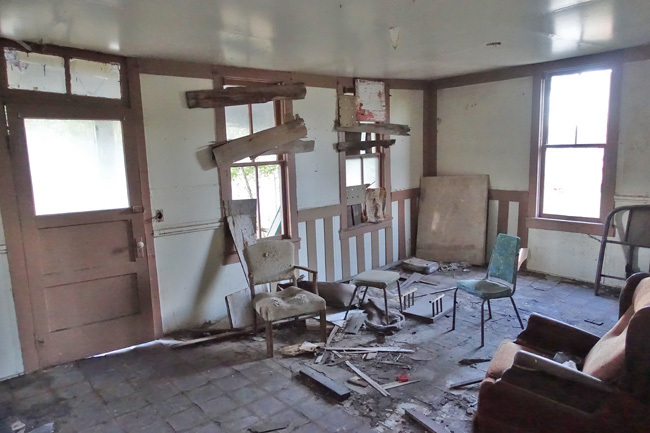 The door to the motel's main office and manager's suite stood open, so I took a quick look inside. 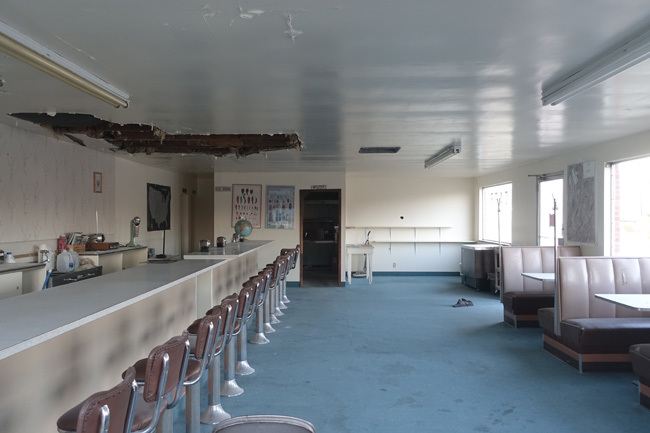 Since its abandonment, the place has apparently served as a hangout for people who had no compunction about leaving their mark. 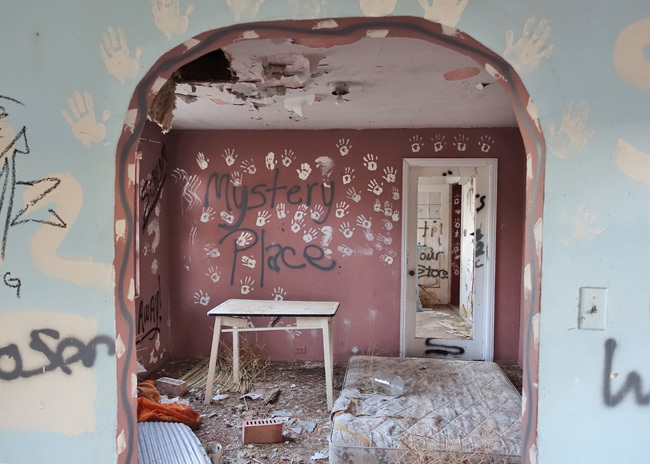 Graffiti and hand prints covered the walls. Tumbleweed had found its way inside through the open door. 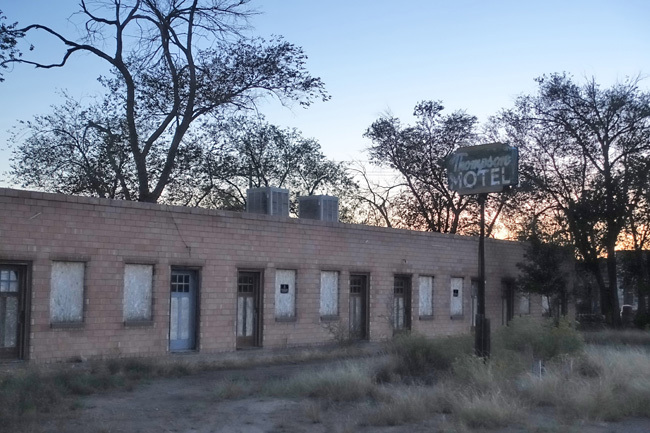 Apparently Thompson Motel was not the only popular hangout among the abandoned buildings of Thompson Springs. 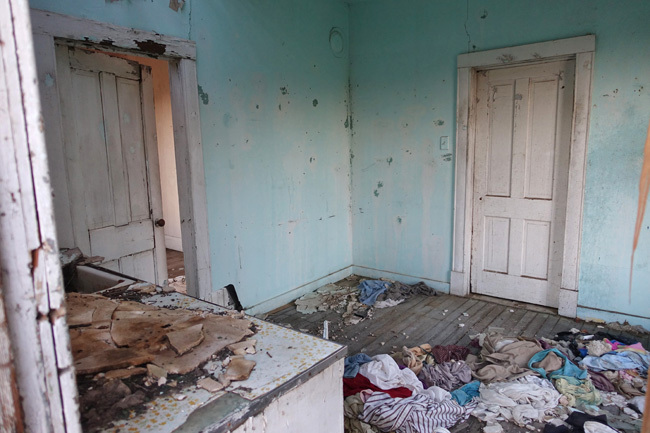 Dusty furniture sat arranged in a circle in the front room of an abandoned house. Down the street a cafe stood deserted. 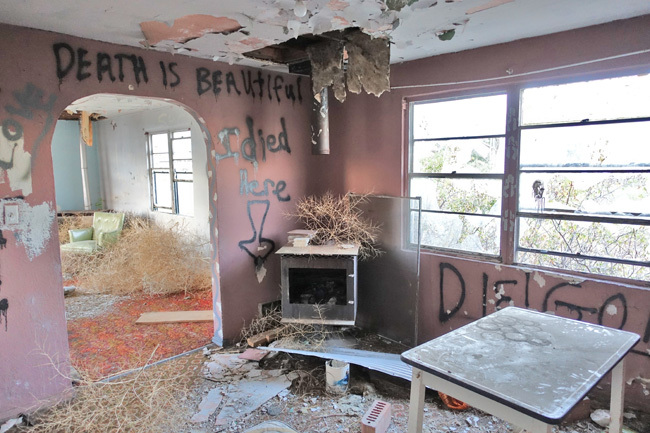 Surprisingly, most of the windows were still intact and the place was untouched by vandals. Inside, the cafe was tidy and looked as though it could reopen any day, except for the massive hole in the ceiling. 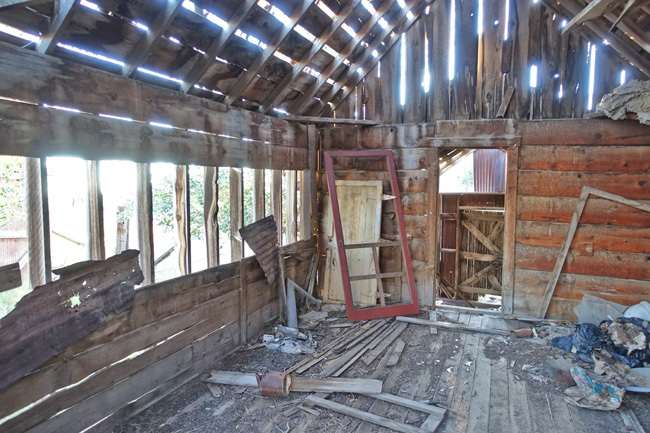 The old Thompson Springs train station has seen considerable decay and vandalism since it ceased operating in 1994. 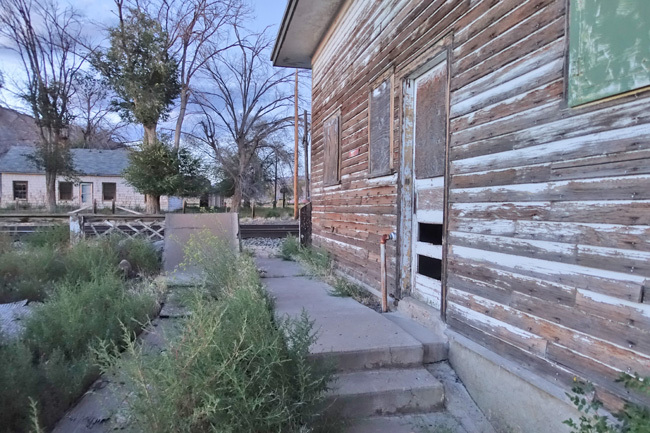 Trains still run through town, but no longer stop there. 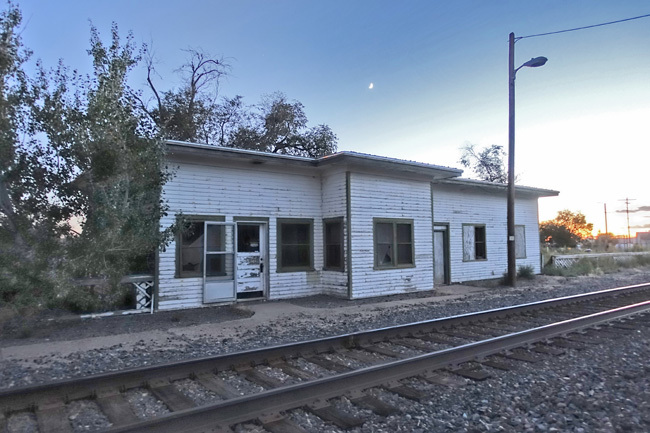 Amtrak's decision to move its passenger platform to Green River, Utah about 25 miles to the west is partially responsible for the decline of Thompson Springs, but several other factors have contributed to the downward trend in visitors. 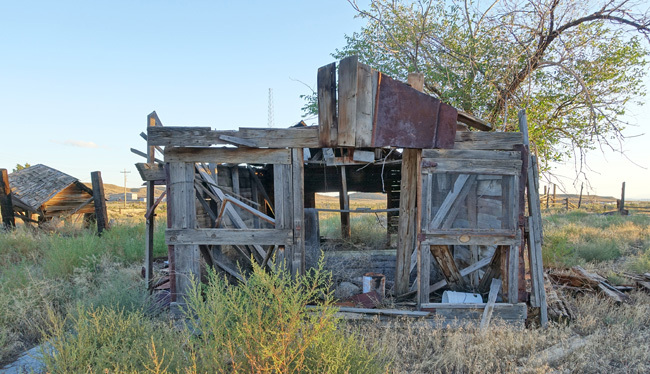 Like so many small towns in the Western United States, Thompson Springs suffered greatly from the construction of the Interstate freeway system. When I-70 opened two miles south of town, it diverted a tremendous amount of traffic away from local businesses. 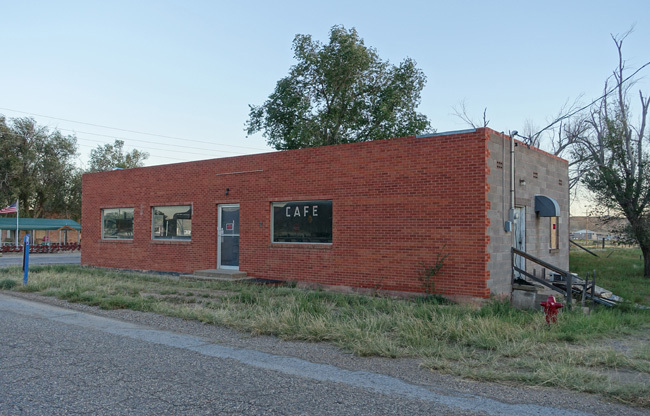 Old Cisco Highway, previously the main thoroughfare, became Frontage Road, and the businesses along it quickly died off. The shell of an old grocery store still stands, though its roof is long gone. 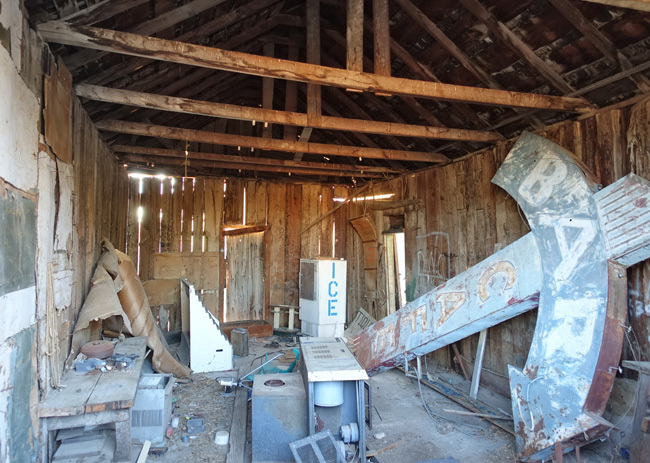 The old lunch counter is weathered and warped from exposure to the elements. 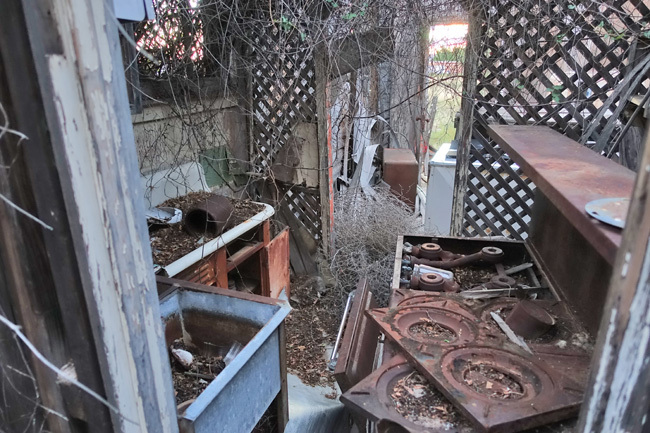 An old stove and sink sit rusting in the tiny kitchen in the back. I would've loved to see this place before its downfall. I found Thompson Springs so enchanting that I completely lost track of time, and before long, daylight had fled from the sky. 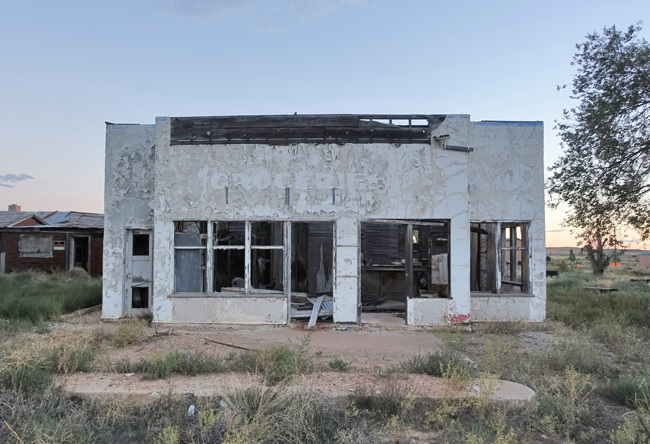 I still had a long drive ahead of me that night, but I refused to accept that I'd missed the opportunity to see what remained of Sego ghost town. 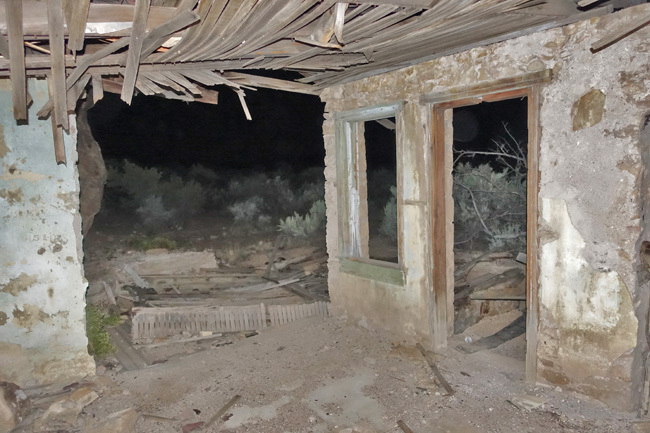 The night was dark as pitch and a coyote howled in the distance as I navigated the rough road into Sego Canyon. 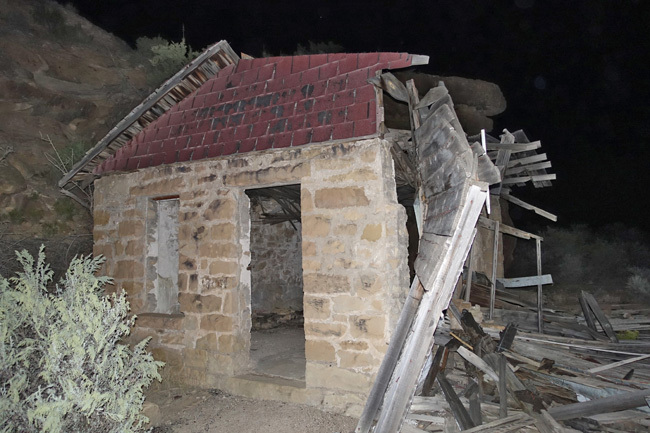 The ruins of Sego are scattered throughout the canyon, but many of the more notable structures, such as the company store and boarding house, have collapsed in recent years. I managed to find a house that was still partially standing. With my high-powered flashlight I was able to snap a few pictures despite the oppressive pall of night. 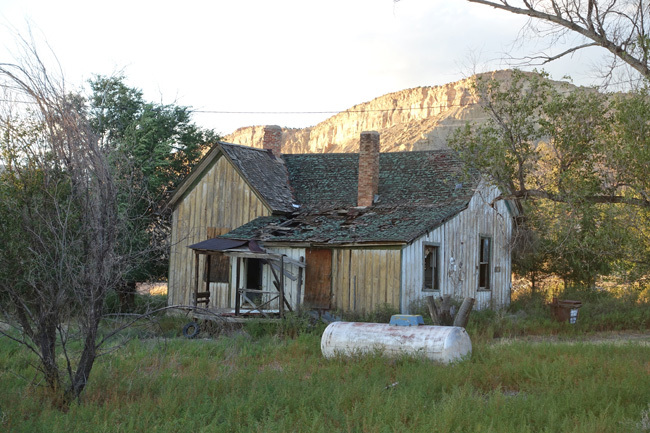 Sego, Utah began as a modest mining settlement among the Book Cliffs of Sego Canyon. Founded by Henry Ballard in 1908 after he discovered a vein of anthracite coal, the settlement was originally named Ballard. Several years later the name changed to Nelsen, and eventually to Sego in 1918. 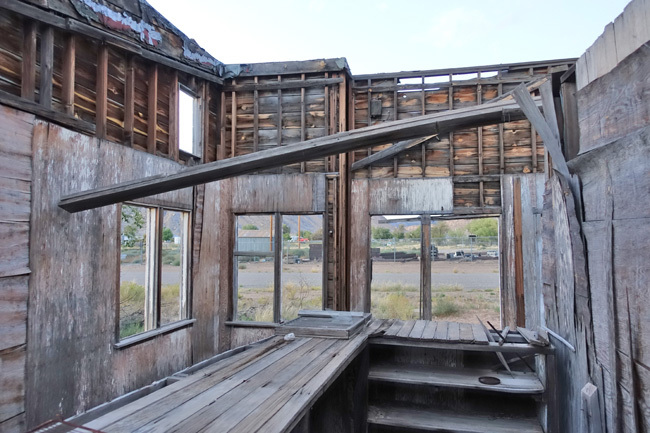 In 1911, Ballard sold the mine to B.F. Bauer, a businessman from Salt Lake City, who created the American Fuel Company. Bauer ramped up mining operations, built the Ballard & Thompson Rail line, and installed the first coal washer west of the Mississippi. The town grew with the addition of a company store, a boarding house, and many homes. Water shortages plagued the young mining town, as did flash floods that frequently crippled the railroad and damaged its bridges and trestles. Employees of the American Fuel Company faced many of the same abuses as other miners of the pre-labor movement era (see my article on the United Mine Workers strike, which culminated in the infamous Ludlow Massacre), including severe wage cuts, price gouging at the company store, and having to wait up to five months for their paychecks. Conditions improved after they joined the United Mine Workers in 1933. When the American Fuel Company closed in 1947 due to falling profits, its workers pooled their resources and formed the Utah Grand Coal Company. The endeavor was profitable in its first year, but soon suffered a series of crippling setbacks. Fires in 1949 and 1950 destroyed much of their equipment. When the railroad industry switched from coal-powered locomotives to diesel engines, the demand for coal fell dramatically, leading to the company's closure in 1955. After snapping a few shots of the old house, I decided to leave Sego. 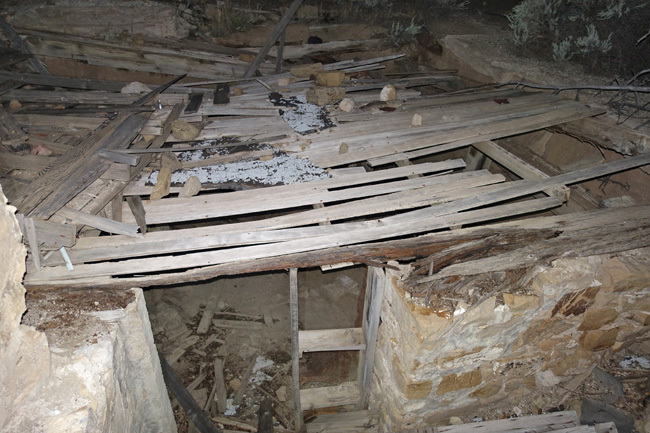 I'd noticed several root cellars hidden among the brush, and realized that it would be easy to accidentally fall through one of their unstable roofs. With no one else around for miles, it was not a risk worth taking. I returned to the main road and made my way eastward into Colorado, where I visited the incredible mining ghost town and EPA cleanup site of Gilman. 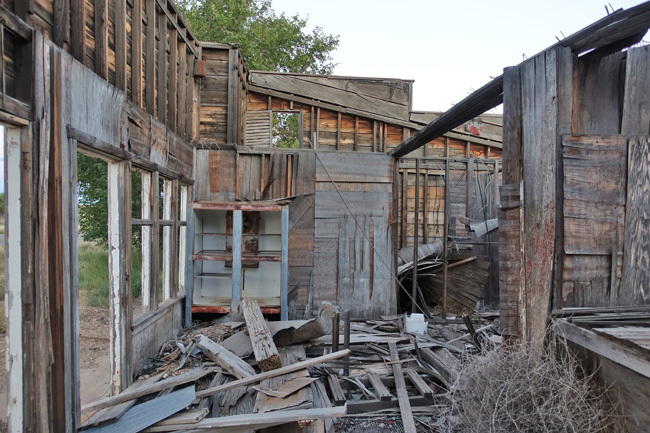 It was one of the largest, most interesting ghost towns I've explored. Fabulous. Love your work. Thank you for sharing. And by the way--duh duh duh---I was thinking Green River, WYOMING in your last post. You won't find a Wild Horse Canyon road in Utah. Sorry. I have no clue what happened there. Thompson is a great town. You're lucky to live in such a unique place. 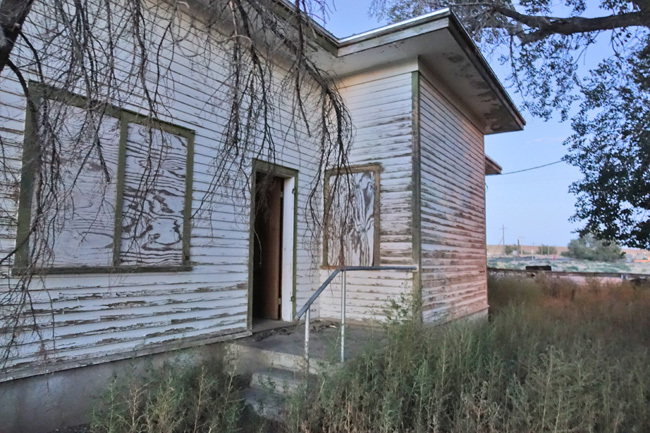 I avoid going inside the buildings that have No Trespassing signs posted, but I barely saw any signs. I would have explored much more of Sego if I'd had any daylight left, but I figured trying to navigate it in the dark would be asking for trouble, since I didn't know the area too well. I thoroughly enjoyed the time I spent in Thompson while I was working on I-70 back in '93. The two sisters were life savers!! Valley Asphalt's whole crew owes them a debt of gratitude. The best sleep I have ever had, before and since, was in that motel....I'm still searching for a bed that comfortable. They packed sack lunches and snacks for us to take to work and were ready to feed us when we got back. It was the son of the one who ran the cafe who got us interested in the history of the area along with his collecting of arrowheads. It was fun playing pool with him too after the guys I worked with wouldn't go against me any more. Fond memories and tragic. That's where I injured my back, was there when my baby brother died and many husband made the 4 hour trip in 2 1/2 hours to fetch me at 5:00 a.m. and one of my co-workers was killed on the job the next week. I still make time to visit when I pass through. What a beautiful example of small town hospitality. Thank you for sharing your memories of Thompson. I'm sorry about your loss and injury. I hope that your pain, emotional and physical, has eased over the years. It's great to hear that you still visit from time to time. Do the two sisters you referred to still live in town? Really interesting info! Thanks so much for sharing. I especially enjoyed the video. It's interesting to hear the stories of those who lived there. She sure had a lot of sadness in her life though. It looks like some of the buildings have become more weathered and vandalized since the video was taken. Thanks, I love the images and your writing, I am hopefully going to visit this place soon. Thank you, Carl! You definitely should check it out. It's an amazing place. There was so much to see; I spent hours there and the time really flew by. It looks like you went recently.... The roads up to Thompson Springs are still paved? Maybe the roads to Sego may not be paved? This looks like a neat place to explore. You certainly had a good time! It also seems that it's ok to explore these properties- there are no 'no trespassing signs' up? Thank you for sharing! It really was a great time. Thompson Springs has paved roads, but the roads into Sego are very rough and unpaved. It looks like people ride ATVs up there a lot. You definitely need a vehicle that can handle rough terrain. If you're going to check out the town, keep an eye out for No Trespassing signs. There were a few of them posted and I avoided those properties. Thanks Gran! It sure us a neat town. I hope I get to visit again before too long. Thank you for following my writings! I hope you're having a great time on your travels. I'd love to read about your travels. Please send a link if you have stories posted online.